For fighter info, see Incineroar (SSBU). Official artwork of Incineroar from Pokémon Sun and Pokémon Moon. Incineroar (ガオガエン, Gaogaen) is a fictional creature from the Pokémon series. It debuted in the series' seventh generation as Alola's final stage Fire-type starter Pokémon, and represents that generation as a playable character in Super Smash Bros. Ultimate. 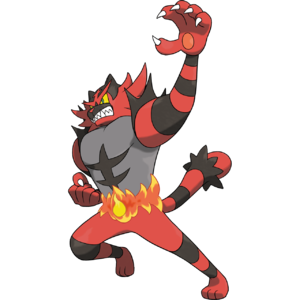 Incineroar is a bipedal feline Pokémon, and is categorized within the Pokédex at #727 as the "Heel Pokémon". Incineroar is a dual Fire/Dark-type Pokémon, and is the final evolved form of Litten, after having evolved from Torracat at level 34 onward. As Litten, it is one of the Alola region's three starter Pokémon. In addition to using a mix of punches and kicks, Incineroar can emit streams of flame from its navel. On a related note, it is typically seen with a "flame belt", which consists of flames ringed around its waist to resemble a championship belt. True to its Pokédex categorization, Incineroar behaves much like a heel in professional wrestling. It is known for being selfish, egotistical to the point of ignoring its own Trainer's commands on a whim, and brutal to the point of even potentially attacking the opposing Pokémon's Trainer. Despite these inflammatory traits, Incineroar is not exclusively antagonistic. It deeply values the reception of a crowd; its fighting spirit intensifies when a crowd is excited, whereas its focus wavers if the crowd is unenthusiastic. On a related note, Incineroar is especially fond of appealing to children and young Pokémon. Although it plays up its status as a heel by acting coldly toward them, it becomes extremely happy internally upon receiving their admiration. Incineroar also has a sense of honor, as it will lose the desire to fight an opponent that is weaker than itself or injured, similarly to Charizard. Incineroar's default Ability is Blaze, which increases its Attack and Special Attack statistics by 50% when using a Fire-type move so long as it has a third or less of its Hit Points remaining. Its Hidden Ability is Intimidate, which decreases the opponent's Attack by one stage whenever Incineroar enters a battle. Like Decidueye and Primarina, its fellow fully evolved Alola starter Pokémon, Incineroar has both a signature move and signature Z-Move. In Incineroar's case, it can learn Darkest Lariat, which can be converted into Malicious Moonsault as long as it holds Incinium Z. Thanks to Incineroar's above-average Attack stat, respectable defensive stats, potent offensive typing, and the utility provided by both Intimidate and its moveset, it is renowned as one of the most useful Pokémon within the competitive Pokémon metagame's double battle format. However, Incineroar's below-average Speed stat and vulnerability to common attacking types generally result in it struggling in single battles, and thus being placed within that format's lower tiers. In the Pokémon anime, Incineroar appears as the main Pokémon of Professor Kukui while under his Masked Royal persona. It developed a rivalry with Ash's Torracat ever since it was a Litten, and is shown to be incredibly powerful in battle. In I Choose You!, an Incineroar appears under the ownership of Cross, the movie's main antagonist. Incineroar, as it appears in Super Smash Bros. Ultimate. Incineroar appears as a newcomer in Super Smash Bros. Ultimate. It was revealed during a Nintendo Direct on November 1st, 2018, alongside Ken and Piranha Plant. Fittingly for a professional wrestling-based character, Incineroar is a super heavyweight that possesses several heavily damaging moves and powerful throws that can KO very early. It will even strike a pose whenever certain attacks connect successfully. These traits are supplemented by its overall frame data being average, which is atypical of a super heavyweight and even some heavyweights. However, Incineroar also lacks any strong approach options and suffers from a notably poor recovery. Incineroar’s moveset complements its hard-punishing playstyle, as it relies on strong single-hit attacks to deal damage. It boasts one of the strongest back throws in the game, making for a potent killing move at the ledge. Aerial attacks are generally used for juggling or creating space, as his air speed does not encourage aerial combos. Smash attacks are fast, dangerous, and generally safe on shield, and each smash attack comes with its own perks. Its neutral special, Darkest Lariat, comes out early and lingers for a long time. Alolan Whip is its side special and a versatile command grab; it can be used to KO horizontally or vertically depending on the player’s input and does not leave it helpless in the air, aiding its recovery. The up special Cross Chop is deadly when it connects on-stage, but risky when used off-stage due to its linear travel distance. Finally, Revenge is a unique counterattack that stores the power of the inflicted attack for Incineroar’s next move. This could lead to absurdly early KOs if a strong-enough attack is absorbed. Incineroar’s inclusion was the only one in the game’s base roster to be decided at a later point, rather than during the original planning stages. A spot had been reserved for an unspecified Pokémon from the seventh generation and after seeing the new Pokémon from Sun and Moon, Masahiro Sakurai narrowed the choice down to two options: Incineroar or the Grass/Ghost-type starter Decidueye. Sakurai ultimately chose Incineroar due to its inherent potential for a unique fighting style, as a dedicated wrestling-themed fighter had not been attempted before in the Super Smash Bros. series. 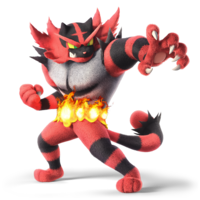 Due to Pokémon Sun and Moon being released in November 2016, Incineroar is the most recently debuted character in the Super Smash Bros. series. Incineroar, Roy, Lucas, Greninja, and Dark Pit are the only characters to have never appeared on a home console outside of the Super Smash Bros. series. Incineroar is the third playable Pokémon that is the final evolution of a starter Pokémon. The first was Charizard and the second was Greninja. It is also the second fully evolved Fire-type starter Pokémon, with the first being Charizard. It is also the second dual-type Pokémon to have Dark as its secondary type, with the first being Greninja. Incineroar is the first playable non-Generation I Pokémon to debut in an odd-numbered generation. Incineroar is the only dual-typed Pokémon to not use any moves derived from its primary type. However, three of its special moves (Cross Chop, Revenge, and Max Malicious Moonsault) reference its primary type, thanks to having the flame effect. Due to its special moves being physical attacks, it is also the only Pokémon to use a single damage category. Although Ivysaur's special moves are also physical, it does not fall under this distinction, due to using Solar Beam via Triple Finish. This page was last edited on April 7, 2019, at 22:28.